Chronic pelvic pain affects as many as 15% of all women 18 to 50 years of age, and accounts for up to 40% of all gynecology office visits. Your pelvic pain is considered chronic if you’ve had it for at least six months. While there are many causes of chronic pelvic pain, the one our physicians focus on is called pelvic venous insufficiency . 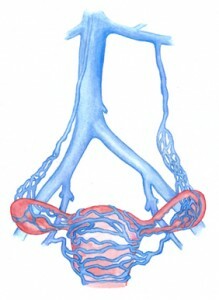 This condition is related to problems with the veins and circulation in the ovaries, particularly overly enlarged veins. You might think of it as varicose veins of the ovaries. The cause of pelvic venous insufficiency is often unknown. It could be related to a physical issue, such as the positioning of the uterus, inflammation, or previous deep vein thrombosis of the pelvis. Hormones are likely also involved, since the condition is more common in premenopausal women. It is also more common in women who have had more than one baby. Pelvic venous insufficiency often goes undiagnosed. Some physicians may not understand the condition; or they mistakenly think there’s no treatment, so there’s no point in a diagnosis. However, our physicians can provide a treatment that may relieve your pain. Ovarian vein embolization is the treatment for pelvic venous insufficiency . Following local anesthesia administration, the physician directs a catheter inserted through a small nick in the groin or the neck to the ovarian vein using continuous x-ray imaging. The physician inserts small coils to block some of the blood flow, reducing the pressure in the vein and redirecting the blood to healthier pathways. Patients are observed in the office 2 to 3 hours after the procedure, and most resume normal daily activities within 48 hours. Embolization is very effective in the treatment of pelvic venous insufficiency : reports from peer-reviewed literature have shown a success rate of 95% to 100%. In addition, 83% of patients reported significant improvement in their symptoms. It is important to note that although the veins we treat are unlikely to come back, in some cases other pelvic veins may require additional treatment in the future.